I had a very horrific moment today and it brought back another horrific moment many years ago... today my darling baby girl was drinking out of the toilet with her little playset cups (thankfully it was flushed... but really, is that any consolation). She has a love for water, and has been recently caught playing in the cat's bowl of water... but I never thought it would come to this. While daddy was gagging, we went into emergency mode and did everything we could apart from making her drink disinfectant. Years ago our oldest was caught giving his pet seal a swim in the toilet... and I thought that was extreme. None of our other children have been at all interested in the toilet water until now! So I am still horrified... the toilet door is now always to be closed... and nobody ever dare forget to flush... and I want to encourage all you people out there to clean your toilets regularly (thankfully I just had!). p.s. the picture above is not my child... I would not have waited around long enough to grab the camera! I would have been worried if you'd managed to whip your camera out for that one! Mine like putting as much toilet paper down as possible .... but that's about it really. i walked in on sapphire eating (and enjoying) dry cat food today! Our dog used to drink out of the toilet (we had an outside toilet as well).. yuck! I haven't got it out of the freezer. I should have, but I can't cook it... so we've been having easy things like toast. lol. Cause Dave's doing it. Not that it's hard to defrost and heat up soup! lol. 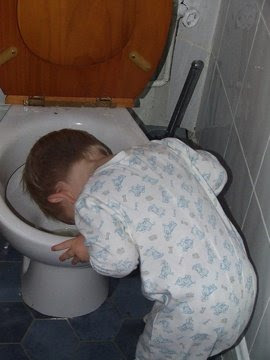 eeeuuuggghhh......I'd better clean my toilet more often just in case PJ tries the same thing! I spoon fed mum toilet water while she was on the phone one day...she was loving it until she realised a 3 year old could not reach taps...! Re:RE: Toilet comment...yeah! Makes you think how much gross stuff goes unnoticed!!! Oh scary..just like the thought of swallowing spiders when you're sleeping!! Your Mandrake would freak out thinking about that! Hehe. oh dear!!! I have yet to encounter that one! I imagine it is just a matter of time! Hah! Kids! They do make life more interesting. And I have to agree with you... It's so important to stop and remember all the joy that is contained in those precious little bodies.